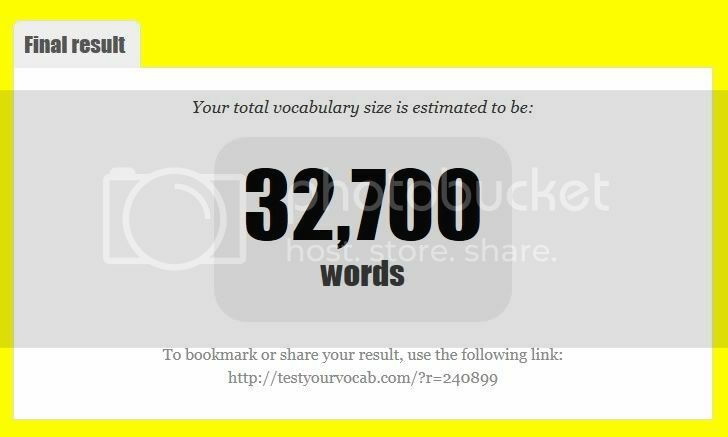 Ever wonder what size English vocabulary you have? Here's a test you can take online to give you an estimate. Test link nicked from Gerard over at The Presurfer. 27,600. Some of those words from the second set? Never heard of them. That last column did me in too, but I came in at 31,000 words. Some of which I attribute directly to having read many, many romance novels over the years. Hmm... 36,200. Okay, so now can I use sesquipedalianism in a sentence? Wow! 19,300!! I don't know if that's good or bad, considering it's my third language (the test said 20,000 or above for a native speaker, so I guess it's not that bad), but I don't have any problems reading books and watching shows and movies in English. Some of the words were really hard, though! I did this test and I did notice a lot of the words were the type you would find in historical novels. If you have never read any I think your score would drop a fair bit. I think bookworms in general have a large mental database of words compared to those who only read occassionally. Also the longer you live the more you collect. I got 27800. It was really hard to not check the boxes of words I know I know how to use, but that I don't really know the definition of. I really want to thank my 9th grade english teacher now. 35,900. Wow all those Georgette Heyer & Jean Plaidy novels from my youth really paid off. 33,000! Whoa...I got 36,300. I blame my love of historic novels and Mr. Dant. He was my favorite high school English teacher and had a weekly vocabulary test with some truly odd, wonderful words. I suspect it's because I write historical romance, because a lot of the words I got were old ones. And I was introduced in the States last year as "This is Lynne. She's British and she talks in complete sentences!" lol, that was fun. 3O,200. I thought I was smarter than that. It's good to be humbled every once in a while. I hit 38,000, but I too write historical and read a tremendous amount of it and many of those words were very old. 31 900 words. Not bad for a non-native speaker. I wish I had found an obvious spot to leave open-ended feedback. When the survey found out I was a non-native speaker it added all sorts of irrelevant questions that were hard to answer because they didn't seem to consider the possibility that a non-native speaker may still have gone through schooling in English in the US. In particular, it would have been helpful for them to differentiate between "English" courses and "English as a Second Language" courses. I came in at 32,000 and was surprised it was that high. The last page was horrific. Like many of the others I think being an avid reader helped. 7,201 - considering im not a native-speaker it's ok I guess. I love these tests! 30,800. Some of the words on the last page were crazy! Did anyone else check out the charts they had which divided results up by age? I thought that was pretty cool to see the gradual increase across the board as people get older.